Fine surgical instruments are too valuable not to protect. WPI’s sterilizing trays help reduce damage from everyday use. With top quality structural integrity, these trays are ideal for the handling and storage of all standard microdissection and surgical instruments. GE’s ULTEM® resin ensures product strength, structural integrity and extended life cycle. See-through lids make it easy to locate the correct instrument. Suitable for all methods of sterilization (autoclave, steam, dry heat and chemical). Unique “grid” design of the base makes it easy to install the silicone finger mat required to protect the delicate instruments. 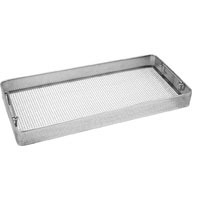 These sterilization trays are typically used in an autoclave for sterilizing your fine surgical instruments. For tips on cleaning, disinfecting and sterilizing your surgical instruments, see our video series on Caring for your Surgical Instrument Investment. Our dry sterilizer is perfect for sterilizing your fine surgical instruments.